Because of broad crossings and exposure to possible wind and currents, this trip is not recommended for novice paddlers. Leaving Cliffs Wharf near Cliffs City, we'll paddle across the Chester River making our way to Spaniard Point at the entrance to the Corsica River. This open water crossing may present currents flowing as much as two knots, depending on the season, the tides, and the amount of recent rainfall. We'll paddle into the Corsica River past the recreation area for the Russian Embassy on the right shore. The Corsica is a popular sailing destination during the summer months. We'll paddle the upper shore. Rounding Ship's Point, we'll head into picturesque Emory Creek, which is sometimes described as resembling a Flemish painting. We'll explore the creek for a bit before turning back to paddle the lower shore of the Corsica, with its elegant homes and sailboats on moorings. 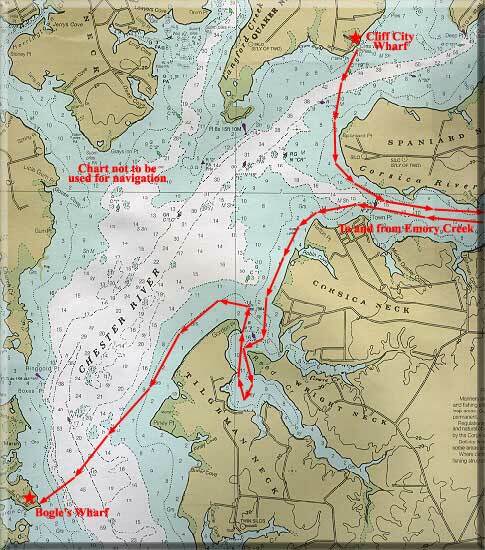 Entering the Chester River again, we'll drop south to Reed Creek with its many coves and varied terrain. Traveling into the deeper recesses of the creek, we'll seek a quiet cove or beach for lunch. If time permits, we'll explore Grove Creek before returning to the Chester. Once in the river we'll follow the current, crossing a broad expanse of the river to our final destination at Bogle's Wharf on Eastern Neck Island.